Football - Illingworth SM v Brighouse Sports. Max Heaton for Brighouse. Brighouse Sports have gone five points clear at the top of Division One in the Haslem-Sheppard Halifax AFL. Garry West’s side beat visitors Elland Allstars 2-0 at Lane Head on Saturday in one of only three league matches to go ahead in the wind and rain. The game, played on a pitch which was slippy but had no standing water, was goalless until approaching the hour mark. Connor Durkin broke the deadlock from Borhan Doski’s lay-off following good work on the right wing from the scorer’s cousin Sam Durkin. Brighouse had ‘keeper Dominic Nolan to thank for retaining their lead. He made a fine double stop and further distinguished himself with a superb penalty save after an Allstars striker had been brought down. Max Heaton made it 2-0 with 15 minutes left. The fullback overlapped down the right and when he got the ball back from Doski he stroked the ball home. 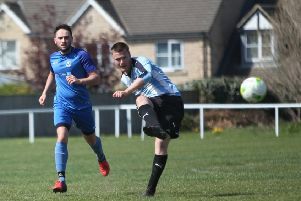 Although the league now only has three divisions, Sports are a bidding for a third successive promotion with Sowerby United and Illingworth St Mary’s their main rivals. He added that Sports were making steady improvement as a club and they had plenty of junior teams to keep producing players for the senior side. AFC Crossleys won the other game in the first division to go ahead, beating Halifax Irish Centre 3-1 at West Vale. The visitors were following up their win by the same score at home to Calder Reserves a week earlier, when the programme was again decimated by bad weather. After a fairly even first 20 minutes, Crossleys took the lead with a good move which started form the back. Tyrin Shields and Nathan Walker played their part before Andy Brunning sent over a pinpoint cross for Craig Gladwin to head home. Visiting player-boss Kev Crossley made a couple of saves before Gladwin got his second. Simon Stockings carried the ball forward and Gladwin, out of the left, beat the defence for pace and slotted home at the near post. Home ‘keeper Joe O’Dowd denied Dave Mlodecki, who went through one-on-one, and Irish got back into it midway through the second half through Luke McCurry after a teammate had got to the ball before Crossley following a free kick on half-way. However, Crossleys made the game safe 10 minutes from time through Matt Clark after a bout of head tennis from Gladwin’s corner. Illingworth St Mary’s Reserves got back to winning ways in Division Two after their recent form slump with a 3-1 win over previously unbeaten Shelf FC on the 3G pitch at Trinity Academy. Shelf started strongly, dominating in the first half with the wind at their backs, but they created little and Saints defended superbly with Kyle Butler, Dale Cartwright and Ben Heavyside outstanding. Shelf took the lead in the second half when Tony Clarke spilled a long range effort and the ball was stabbed home. Saints made changes and it had an immediate impact when debutant Jimmy Smith smashed the ball home from 25 yards only minutes after coming on. Fellow substitute Nathan Madin rattled Shelf with a few strong challenges and he put Saints in front with a long range effort which was deflected past the keeper. Illingworth wrapped up the game in the last 10 minutes when Jack Pullen put Nathan Field through a gap and his first time shot gave the ‘keeper no chance.